Japanese indie title Back In 1995 launched on Steam in April, and whisks you back in time to the '90s when consoles like the Sony PlayStation and Nintendo 64 ruled the roost. This 3D action game uses deliberately outdated visuals to recreate the authentic feel of the period, and at this year's BitSummit event in Japan, developer Degica confirmed that the game - which won the Tokyo Game Show 2015 Spark Award - is coming to the 3DS. Retitled Back in 1995 64, the title differs from the PC original in that it replicates the iconic anti-aliased visuals of the Nintendo 64 system. No release date or pricing has been confirmed so far. Be transported to a world both concrete and indistinct, where you must uncover the mystery surrounding the disappearance of your daughter, the catastrophe that shook the city, and why you've decided to finally return. - Get lost in the nostalgic world of retro 3D graphics, including low res models, texture warping, CRT emulation, and fixed CCTV style camera angles. - Relive the mystery game genre with an old-school user interface and tank controls. 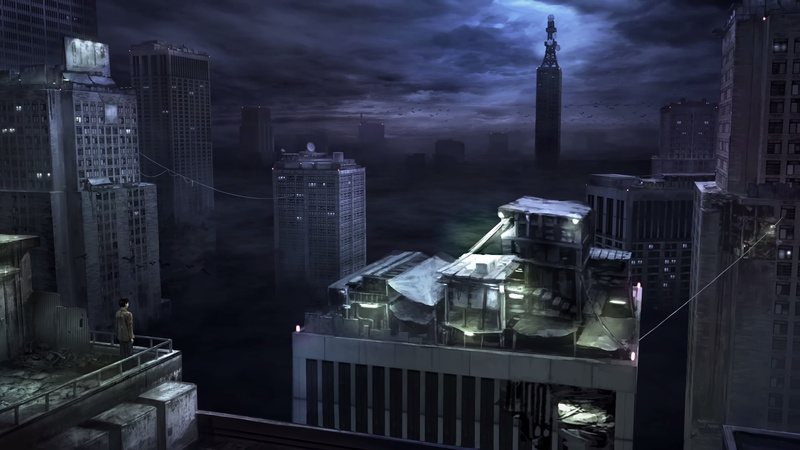 - Explore a sparse cityscape in the year 1995, littered with clues about the past. - Interact with a cast of damaged characters whose intentions you can never truly know. - Uncover the mystery of yourself, your daughter, and what happened to the city. Does this interest you? Let us know by posting a comment. In the meantime, you can watch some trailers for the PC version below. Oh look, it's an actual sequel to the Resident Evil franchise! This does not interest me at all. This would have to rate 8 or higher to even consider it. That looks more like a bad PlayStation game then an N64 game. if the price is right then yes definetly, it says 2 -3 hours playtime so I imagine this will be a budget e-shop release. looks deliciousily retro! love it! @AlexSora89 I was thinking more like an actual sequel to Silent Hill. Games that this is based on did not age well at all, that's why REmake was so successful. As someone already said it doesn't look like N64, it looks like a crappy psone game. Oh my gosh, YES. I'd purchase and preload this right now if I could. The joke works either way whether it's a truer-to-the-text sequel to Resident Evil or an actual Silent Hill game after the cancellation of Kojima and Del Toro's Silent Hills, it's your pick. I hope they're not making the game control badly just because, and that there's C-Stick camera support, and extra modern touches. It has a 5.2 on Metacritic. It's not good. The moment you name your game "anything 64" you already lost me. Most of the N64 games aged like milk visually, why would you want to replicate that carp? @Tsurii Some people love nostalgia. If the gameplay is great, many won't care. Jedi Power Battles proves that (despite mixed reviews and bugs). It looks like Silent Hill 1 did on the PlayStation. it looks like Silent Hill, I'm interested but I"ll wait until the reviews come out. We need more these type of horror games and not the boring walking simulators everone is trying to emulate now a days. Hopefully this will not be old school to a fault, as in beyond homage. I'll check back for the review. I understand pixelart, it can be beautiful. But this? Not at all, looks horrible. @SetupDisk funny how 2d sprite games age better. Back to four swords adventures!! This game looks to be the War Heads sour candy of the game world. I'm ready for my blast if sou.... I mean nostalgia. Yeah, um this looks amazing. The first little teaser looks like Silent Hill so this makes me extremely happy. I just hope that the intended outdated things don't end up harming it. I'm a huge fan of older games, even with their original controls, so I think I'm set to have a good time. Also hope this isn't too expensive being so short. I'm ready! This is exciting! I think it's charming. Low-poly can look great if done right. Not that this raises the bar or anything, but it still looks cool. I'd much prefer a game looking like this than another '8-bit' indie platformer. Great to see this getting a console release, although I did not expect to see it on 3DS! Seems cool, but too short. I get nostalgic for the gameplay of older games, but not the graphics. Even in 1995, I used to say, "This game is fun, but I can't wait until graphics get better." I haven't heard great things about this game. I was looking forward to the PC release, but the reaction it got was extremely mixed. Too bad, because I love this idea of a retro game going back to early Saturn era graphics. "as a means to replicate the unique feeling he had from his first gaming experiences: the PlayStation and the Sega Saturn"
Exactly - it was designed to look like a PS1 or Saturn game. Releasing a "64" version with fuzzy anti-aliased graphics will make it look worse... 32bit graphics have aged better than the 64 bit ones, in general. Whilst it was impressive at the time, the fuzzy/soft-ness and fog draw-in of many N64 games makes it hard for me to play them nowadays on the original hardware (though I still play through emulation or VC with cleaner picture) - whereas I love me some native PS1 and Saturn stuff. I'm a sucker for low poly models when used well. Personally this looks pretty interesting to me - I like this genre of game, really dig the nostalgia vibe and the graphics are on-point for the era... though if they make the Nintendo versions fuzzy as suggested, I'll definitely play it on PC instead. It doesn't interest me, but I'm sure it'll interest others who enjoy that genre. Who would deliberately choose to mimic one of the ugliest visual periods in the industry's history? So? That's not a response to what I said. Of course you can still play them. It's just an ugly art style that you probably have to put serious work into achieving nowadays. I actually really like this low-poly PS1 / N64 look, although this game isn't a perfect example of doing that style right. In any event, I'm interested. So... is this a good thing, or should it stay in 1995? This looks nowhere near close to the visual quality on Nintendo64. Looks more like a PlayStation title. @Tsurii that is sacrilege to the highest order. Could be actually really good if done right.... but then again, there are hundreds of awesome free stuff in that style on the web. Thank you Unity. I'm really just pleased that this is an indie game made by a Japanese studio. Usually it's some American douchebags doing their best impression of Japanese games that look like this, while missing on everything that made those games good. This interests me like the port of Resident Evil on the Gameboy Color does. Oh, well, don't get me wrong, I adore sprite art myself. I just don't think that many indie games really come close to what we actually got back during the SNES era, and the indie scene is really the only place we see a large quantity of sprite work. But yeah, I would totally prefer incredible spritework over 3D any day, I just think low-poly has its charm. I wish more people made throwbacks like this. That does not look too great, and I'm not saying that because of the style direction. The lighting looks off in every room, WAY too bright. Seriously, no true horror game should be this bright! It's like broad daylight. That ain't scary at all. The enemies also don't seem to cast shadows as far as I can tell, and have janky, unfinished looking animations (not creepy intentional jerky movements like Silent Hill). Anyone else notice the textures stretching while the camera was turning, too? Umm looks pretty bad in the videos. What happened did they make a crappy looking game and decide it was a retro 64 title? I just want to say, I have nothing against the graphics of this. In fact, I wish more indie game makers did this and went for the early, low poly PSX/Saturn style. However, the game needs to have its own ideas and not just borrow everything from a single source. This kind of looks to Silent Hill what New Super Mario Bros is to the old 2D Mario games: lacking a soul of its own while reeking of being a copy of copy. Here's hoping when I try it out that I feel differently, of course. The trailers don't make this look that great. I love old survival horror games from the psone era, but where as this could have been a retro game in that style which has the opportunity to be better then what came in the past I have big doubts this will come close to the classics. It doesn't have pre rendered backdrops, and so does look more like Silent Hill and Dino Crisis. The character models look closer to the original Alone in the Dark from 1993 then anything else. There was also the Resident Evil 2 demo for the GBA - Leon looked deformed in that and this is kinda similar. I'd love for a new Resident Evil 1-3 style game to come out. Pre-rendered backgrounds, item boxes, save points, puzzles - I miss all that stuff! I'm not wild about the visuals, but the music is great! If they don't change anything from the PC version, then your fears are realized. This game has really lackluster gameplay, story, and enemy design. On top of that, it's short and they're charging a pretty penny on PC. People often say that N64 games have aged really badly, but I don't find this to be true. Games going for realistic human character models, like Goldeneye (and to a lesser extent Perfect Dark), look a bit ropey now, but games like Mario 64, Mario Kart 64, Jet Force Gemini, Banjo Kazooie, Banjo Tooie, Conker's Bad Fur Day, Ocarina of Time, Majora's Mask, Ridge Racer 64, Donkey Kong 64 and Diddy Kong Racing all still look fine. That said, this game looks pretty rubbish and probably is judging by the reviews of the PC version. This game looks awesome as a person in my late 20's this game is obviously aimed at my demographic. I love the art style, the atmosphere, and the concept of this game. More good retro style new games are needed because so much of the modern games that come out now are horrible. That headline may have been the hardest one to parse I've seen on here to date. What a name!